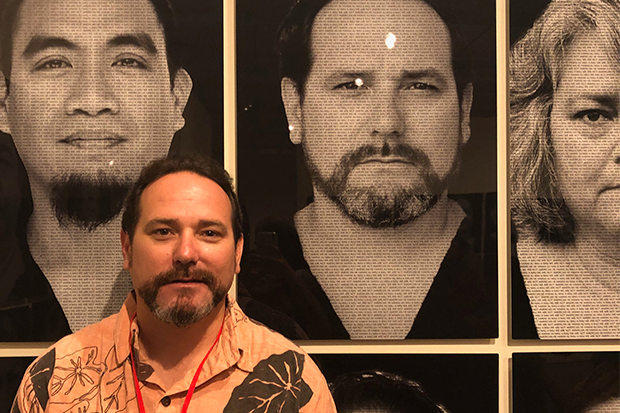 As part of the Honolulu Biennial, Hawai‘i-based artist Kapulani Landgraf presented 108 photographic portraits of Kānaka ‘Ōiwi (Native Hawaiian people)—all of whom work across disciplines and across initiatives to inspire positive change in Hawaiʻi—mounted floor-to-ceiling on gallery walls. Called ‘Au‘a, which means the body of work began as a response to a historic speech delivered by scholar and political strategist Dr. Haunani K. Trask at ‘Iolani Palace in 1993. Trask’s chanted words, “I am not an American,” are projected upon the portraits. Below is the perspective of one of those photographed. Dr. Kamanamaikalani Beamer is a familiar face at the University of Hawai‘i–Mānoa where he is an associate professor at the Kamakākuolani Center for Hawaiian Studies in the Hui ‘Āina Momona Program with a joint appointment in the Richardson School of Law and the Hawai‘inuiākea School of Hawaiian Knowledge. He’s also a director of Stanford University’s First Nations Futures Institute, a resource management development program for indigenous leaders developed by Stanford, Kamehameha Schools, and Te Rūnanga o Ngāi Tahu in New Zealand. He’s written extensively and researched on resource management and governance. If his love for the ‘āina isn’t apparent yet, he also maintains lo‘i kalo with his family.